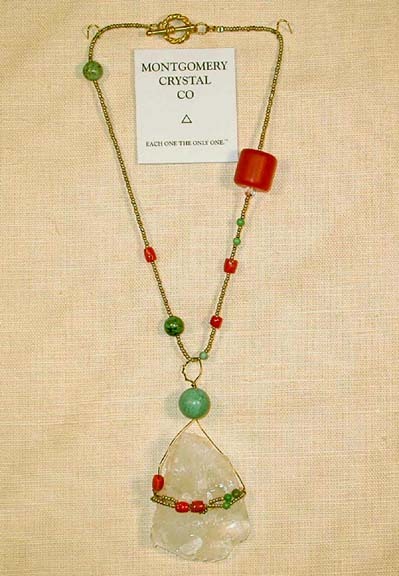 A natural Arkansas rock crystal rarity you may wear on - or slide off - this choker of natural antique coral [pre-embargo], African and Chinese turquoise, rock crystal, copal ['young' amber] and delicate embroidery beads to have more than one elegant look. 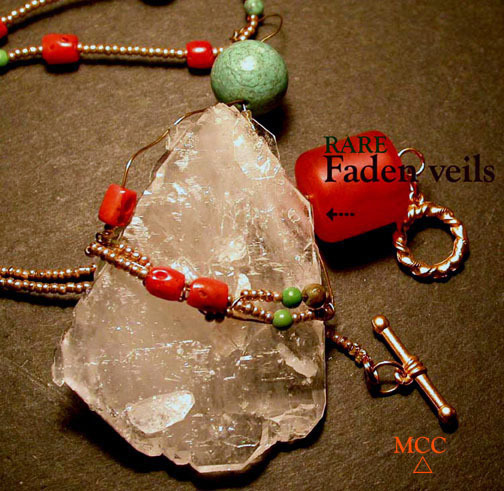 Tabular [flattened, two opposing sides are broader than the other two pairs of sides] crystals are uncommon...and rarely are found with faden [string] veils - this crystal has them and multi-rainbows, too! 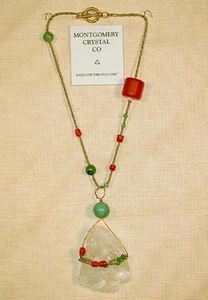 Choker is 16" and the brass-wrapped pendant is 4" long, with plenty of loop to slide right on to your other chains. Also consider our turquoise convertible hoops on the earring page to complete your look! Sent gift boxed and handwritten description on the reverse of our enclosure card. Shipping will be added.